inkle blog - inklewriter goes live! Yesterday we finally hit the big red Go! 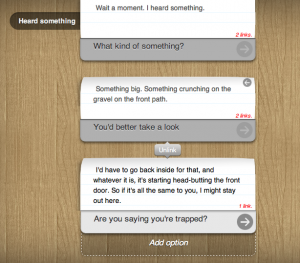 button on inklewriter, our web-based tool for writing, play-testing and sharing interactive stories. We've been working on this for a few months now and been through a few iterations, from our earliest sketches on a coffee-shop notepad to the final version, which is now ready for you to try. So what are you waiting for? For announcement day, we prepared a simple little story for you to try out: "Neighbourhood Predators". This was supposed to be the world's first inklewriter story, but unfortunately we were pipped to the post by a tester on Twitter who released this interactive version of Rick Astley's Never Gonna Give You Up. Rickrolled on a Day One. Thank you, the internet. The idea behind inklewriter is that writing branching interactive stories is really about writing, and what writers need is a blank piece of paper and no distractions. So while your story can have choices, and split and join back together, when you're writing a story-thread there's nothing on screen but the story you're trying to tell. Want to change to a different thread? Simply rewind the story and play a different way; or use the content index to jump immediately to a different paragraph. Behind the scenes, the writer is indexing everything, the content is fully searchable, and in jumping from paragraph to paragraph the tool uses AI-pathfinding to get you the best route. 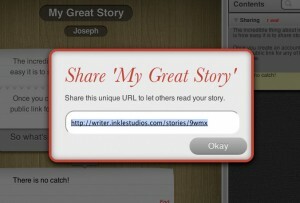 Once you've written your story and signed up for an account, you'll unlock the ability to share your stories by simply sending out a link. Twitter, Facebook, whatever way you want to share. We hope people find inklewriter fun and easy to use - let us know what you think at our contact address, [email protected], and don't forget to follow us on Twitter @inklestudios for updates.